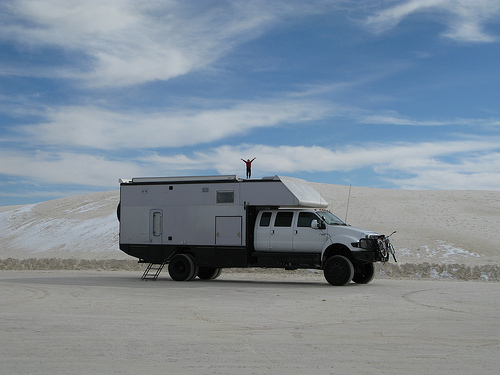 Join us as we explore the world in our carbon-neutral, 4x4 expedition vehicle called The EcoRoamer. We are happy to share our travel adventures, family memories and homeschooling experiences as we journey down the road less traveled. (foolishly) we found ourselves in Moab this past weekend, hanging out with Jay Couch and the guys from Moab Mogfest. A really great group of people, with some pretty amazing trucks. However, an EcoRoamer is no Unimog. I think the difference is best summed up by Alice when we pulled in to Moab and she said: “Oh my goodness, look at those mogs, they’re so ‘cute’!” — there are not a lot of vehicles out there that make a mog look small and cute. So, we were there, and the weather was nice, so we decided to try out a couple of trails. We headed out on Secret Spire, and made it about 2 hours down the trail before we got hung up on our break-over angle on a particularly steep rock shelf. oops, time to go home. We won’t be doing that again (for fun). On the next day we randomly ran into Jim & Wendy who we met at the Overland Expo. They were in town in their new (to them) Earthroamer 040. We had a great time, and I would definitely recommend the White Rim Trail from Potash Road up through the Shafer Hill switchbacks. Special thanks also has to go out to Brian Croak (Aka: Ford Prefect) who joined us in his Jeep and raced across several crazy canyons to take this photos – Thanks Brian! We’re now camped out in the Grand Tetons, north of Jackson, Wyoming on our way towards Montana, Seattle and Vancouver.